How to add new node in XML file using DOM Parser in Java? 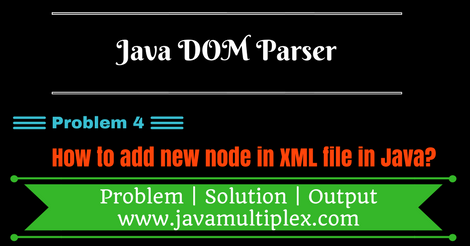 Home DOM Parser How to add new node in XML file using DOM Parser in Java? Suppose we have following XML file as an example. Here requirement is to add new child node Employee. User has to enter all the relevant information related to Employee. 1) Parse XML file or Create an instance of Document interface present in org.w3c.dom. * package. For Creating an instance of Document interface we need to use DocumentBuilderFactory, DocumentBuilder classes present in javax.xml.parsers. * package and File class present in java.io. * package. 2) Enter all relevant information related to Employee. 3) Now create new node (Employee) as follows. Create an instance of Element interface present in org.w3c.dom. * package. For uniquely identifying this node we need to set its id. With the help of NodeList interface we can do this task as follows. Employee has some properties, for each property we need to create element as below. We can set its value as below. One by one make these properties as a child element of Employee element as below. 4) Now make this new node (Employee) as a child node of root (Employees) node. 5) Create an instance of Transformer class present in javax.xml.transform. * package. For creating an instance of Transformer class we need to use TransformerFactory class present in javax.xml.transform. * package. 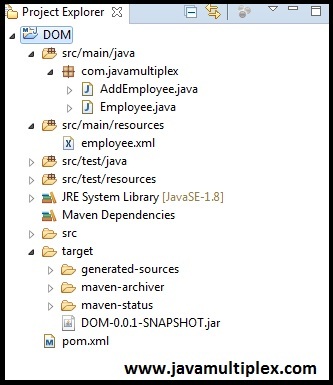 7) Create an instance of DOMSource class present in javax.xml.transform.dom. * package and pass instance of Document interface created in step 1. 8) Create an instance of StreamResult class present in javax.xml.transform.stream. * package. For creating an instance of StreamResult class first we need to create an instance of File class present in java.io. * package. 9) Transform XML Source to a Result. Note : I suggest to use latest version of all the software. If you need any help regarding these software installation please comment below I will help you. Click here for more questions on DOM Parser.